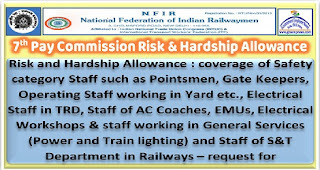 Sub: Risk and Hardship Allowance — coverage of Safety category Staff such as Pointsmen, Gate Keepers, Operating Staff working in Yard etc., Electrical Staff in TRD, Staff of AC Coaches, EMUs, Electrical Workshops & staff working in General Services (Power and Train lighting) and Staff of S&T Department in Railways-reg. Kind attention of Railway Board is invited to Federation’s letter dated 29/08/2017 wherein it was requested to take action for covering the remaining categories of P. Way staff such as Black Smiths, Welders etc., for payment of Risk & Hardship Allowance as their duties/responsibilities are also risky and hardships prone due to the fact that they are required to work physically on the P. Way tracks and that the 7th CPC has unfortunately failed to consider the role of these staff in laying/maintenance of Railway tracks. However, decision for payment of Risk & Hardship Allowance in favour of these P. Way staff working (Black Smith, Welders etc.,) is yet to be taken by Board. A copy of Federation’s letter dated 29/08/2017 on the subject is enclosed for ready reference. Further to above, Federation finds that the jobs performed by Pointsmen, Traffic Gate Keepers, Traffic Assistants (Operating Department — working in Yards, stations etc.,), Staff of TRD/OHE, AC Coaches, EMU Car Sheds, Electrical Workshops, General Services and S&T Staff are also risky consequently they are prone to accidents and health hazards. These categories have not been covered for Risk & Hardship Allowance under the Risk & Hardship Matrix (Cell R3H2) due to the reason that the 7th CPC had failed to give weightage to the nature of duties and responsibilities being performed by these staff. The Railway Board also has not taken initiative to highlight the Risk and Hardship conditions before the Committee on Allowances headed by the Finance Secretary, Government of India. NFIR, therefore, requests the Railway Board to kindly arrange to initiate action for covering P. Way Staff such as Black Smiths, Welders, Helpers, Pointsmen, Traffic. Gate Keepers, Traffic Assistants (Operating Department), Electrical Staff working in TRD/OHE, AC Coaches, EMU Car Sheds, Electrical Workshops, General Services and S&T Staff under Risk and Hardship Matrix (Cell R3H2) for payment of Risk & Hardship Allowance @ Rs. 2700/- p.m. Action taken in the matter may kindly be apprised to the Federation soon.